August 30 is the first anniversary of my Heinkel blog. Thanks to everyone who has read the blog, offered comments and suggestions, provided material, and passed the word. I didn’t have a lot of expectations when I started my blog; my goal was help other people as I’d been helped over the years by those who have published blogs and “how-to’s” about scooters and cars on the internet. I learned a lot, and hoped to be able to return the favor. Now for some interesting facts. I’ve been running Google Analytics on my site since October, 2012. 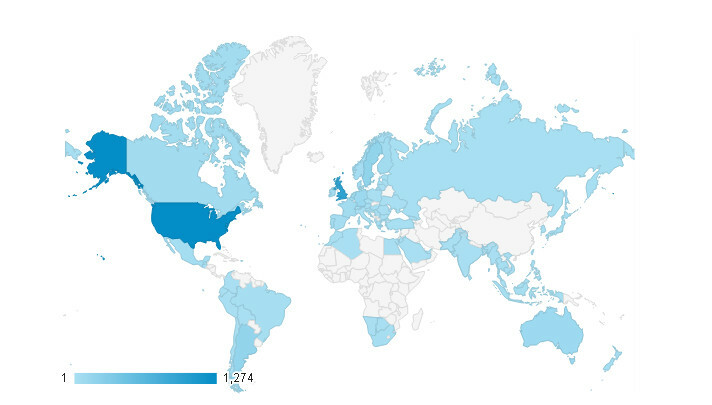 I’ve accumulated some insight on who visits, when they visit, and what they look at. A picture is worth a thousand words. People visit from all over the globe on a regular basis. The most popular countries (in order) are the USA, UK, Sweden, Argentina, and Germany. Pageviews: 24,000 (about 80 a day). Bounce Rate (the number of people who visit the site and then leave immediately): 7.26%. This is a great number. This means over 92% of the people who visit read other parts of the site (on an average about 6.5 pages) and are engaged and interested. New vs. Old Readers: Over the period 56% of the people were first time visitors. In the last 60 days this has changed; now about 45% are new visitors. I’m going to try to expand my historic documents and classified sections. If you have document or photos that your think other people would find interesting, please send them to me. I may also feature other people’s project cars, as I know of several restorations currently underway. I’ll also make a decision on restoring my other car. If I do you'll be seeing a lot more information! If you have any suggestions, please send them along. Thanks for reading!